To make a reservation, you must call participating restaurants or lodging establishments. How can I find out which restaurants are open on a certain day? You must call that particular restaurant. Since this a highly anticipated event, it is best to make a reservation as early as possible as dining rooms will be booked. We recommend calling 7-10 days in advance for reservations. Are tips included in the $29.95 price? Gratuity is not included but a 20% tip is recommended for friendly waitstaff that work hard throughout the week for this event. Are beverages included in the $29.95 price? Coffee, tea, and beverages are not included in the prix fixe special. The promotion includes appetizer, dessert, and entrée. Why do some restaurants offer additional items with supplemental charges and others do not? Participating restaurants MUST offer the $29.95 three-course prix fixe that includes at least three choices of each course — three appetizers, three entrées, three desserts. It is their choice to offer additional items to the special menu that are higher priced but there must be at least three non-supplemented choices on the menu. Who can I call with comments about a restaurant? All comments about a restaurant's menu and service should be directed to the particular restaurant. You can call (631) 329-2111 for comments about the promotion overall. Long Island Restaurant Week continues to attain impressive numbers each year. Total restaurant revenue was estimated to be $5,620,000 with New York State taking in an estimated $305,996 in tax dollars. 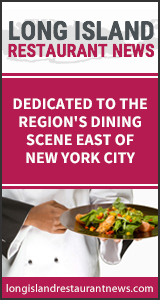 Due to the amount of attention from the media, the official website, www.longislandrestaurantweek.com, received 1.6 million hits from over 111,500 visitors. Many restaurants reported an increase in sales and reservations due to the promotion, some by up to 200% and others decided to extend the promotion. When is the deadline to participate in LIRW? There is no deadline to participate in LIRW. However, we recommend signing up at least six weeks before promotion. How do I sign my restaurant up to participate in LIRW? Click the business sign up icon on Long Island Restaurant Week website and fill out the quick form, including payment by credit card. Why am I paying a fee? A participant registration fee of $495 goes straight to advertising and promotion of this event to help make it as successful as possible. Last year ads have run in New York Times, Newsday, Long Island Pulse, Long Islander, Trends, The Independent, East Hampton Star, Dan's Papers, Southampton Press, Suffolk Times/News Review/North Shore Sun/Shelter Island Reporter, WBLI, WLIU. Do I have to pay a fee if I have 2 or more restaurants? To be fair, all restaurateurs must fill out a sign up form and pay the $495 fee for each entity. That is, if you own if you own two restaurants, you must fill out one form for each entity and pay the $495 fee for both, totaling $950. There are no 2 for 1 deals. Do I have to pay a fee twice if I have 2 restaurants with the same name in different locations? Yes. Each restaurant will be listed individually and included in all press material as a separate restaurant. To be fair, you must pay the $495 fee for each entity. There are no 2 for 1 deals, even if restaurants operate under the same name. When will my business be included on the website? The LIRW website is updated regularly. Your business will be listed within a few days after you sign up. 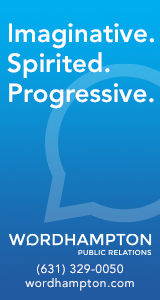 Can I include the LIRW logo on my website and in my ads? As LIRW approaches, all participants will receive the official LIRW logo to display on their websites and ads via email. You may also email marketing@longislandrestaurantweek.com to receive the logo. I just filled out the participation form and paid the fee, how can I get a receipt? Email marketing@longislandrestaurantweek.com to receive a receipt for your participation. I am a participating restaurant, what do I do now that I have signed on? Participating restaurants MUST offer the $29.95 three-course prix fixe all night every night they are open from Sunday to Sunday, except Saturday when it only has to be offered until 7 p.m. Please follow this schedule. The three-course prix fixe MUST include at least three choices for each course — three appetizers, three entrees, three desserts. If you would like to add additional items to your prix fixe menu that are higher priced, you may add them with a supplemental charge. This is provided that there are still at least THREE non-supplemented choices on the menu. You may also offer your existing menu. Does my restaurant have to offer the minimum three appetizers, three entrées and three desserts? We expect all restaurants to follow the guidelines they agreed to when signing up to participate. The commitment to participate in the spirit of LIRW is to offer the minimum 3 choices of appetizers, entrées and desserts in addition to items with a supplemental charge. Do participating restaurants have to accept reservations? Your restaurant does not have to accept reservations for LIRW if you prefer not to.